Petite Sirah is not a small grape nor is it a Syrah. It is a dark colored, full-bodied grape varietal. 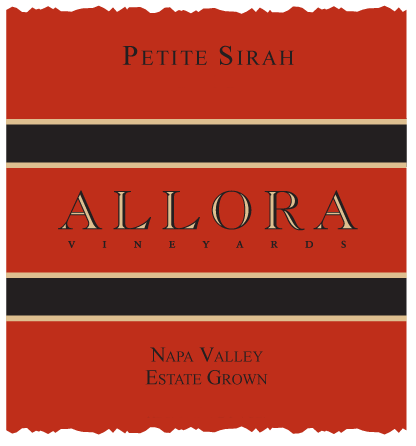 Although sometimes found in blends, the unique micro-climate and soil conditions at Allora Vineyards are ideal for growing Petite Sirah. The aromas of this unique wine are of wild currants and raisins resonating with hints of black pepper. It is a remarkable balance of intense dark color and a memorable finish. A visual spectacle of rich, exuberant black fruit. Hints of orange peel, smoke, mint and licorice add depth in abundance. This Petite Sirah is loaded with personality. A dark purple and burgundy color yield to aromas of red currant, cedar, sweet cherry pie, black liquorice and tabacco, ending with a bold and round texture and a bright, long finish. This peppery wine has aromas of dried figs and hints of blackberries and coffe. It pairs well with grilled meats, BBQ, and spiced dishes. This Petite Sirah is a deep and spicy wine with lots of layers. It is dark and rich and pairs well with Lamb and chili. Layer upon layer of complexity and richness with an almost-black color reveals a deep, intriguing nature. It ages incredibly well while being deliciously drinkable now. Plums, wild cherries, olives, grilled herbs, scorched earth, licorice and new leather jump from the glass. A powerful, rich wine both polished and subtle. Powerful vivid blueberry and blackberry notes at the core. Espresso, mesquite, graphite, spice box and gingerbread flavors are an intriguing combination, finishing smoothly. Fragrant violet, mineral and licorice notes are full of personality, with full-bodied tannins and smoky espresso. Dark and rich, with flavors that persist through the finish. Deep and ruby red in color welcoming a seductive blend of blackberry, licorice and cloves to entice the palate. Graceful yet powerful, supported by fresh acidity. Rich flavors of black fruit, ripe plum, black tea, the wine has a voluptuous body while spice continues through the long, drawn-out finish.